Becoming a pirate is a big decision, but not as big as choosing what kind of swashbuckling identity to take on. If your little aspiring buccaneer is looking for a bright and colorful way to sail the high seas, she'll have the best time plundering in this awesome Salty Taffy Pirate Costume! What is a "salty taffy" pirate, anyway? Does she make her own saltwater taffy, and leave pieces of it on the ships she's attacked as a sort of calling card? Or, does it have more to do with her salty personality, and when she's got a ship full of loot in her telescope, she sticks to it like taffy until all of that treasure is her's? Nah, those are good guesses, but this sweet and salty moniker comes from her spending all of her time on the briny open water, while also preferring pastel colored outfits over bland raggedy clothes. 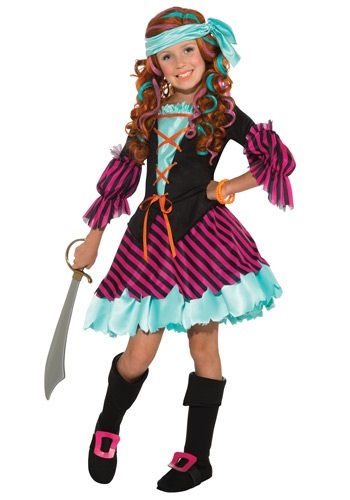 And once you see how cool she looks in this killer pirate costume, you'll totally get what she's talking about! This wicked looking outfit may be bright and colorful, but watch out, that's still a dastardly pirate wearing it! The flashy candy-like colors on the skirt and blouse are perfect for an outlaw who's salty, but also a bit sweet. Once she's put on the matching aqua blue scarf and the cuffed boot covers and grabbed a pirate sword to carry into battle, she'll be the most notorious (and colorful) pirate to ever set sail!